Henry Sidgwick (May 31, 1838 – August 28, 1900) was an English moral philosopher who developed a sophisticated account of nineteenth-century utilitarian ethics. His greatest work, Methods of Ethics (1874), emphasized the “greatest happiness of the greatest number” as the fundamental goal of ethics. He analyzed the intuitionist and utilitarian ethical arguments, showing how the doctrine of common sense rests on the principles of utilitarianism, but in the end could not demonstrate why an individual should choose to sacrifice his own happiness for the happiness of society as a whole. His work has been used as a source by a number of utilitarians, including G. E. Moore, Bertrand Russell, J. J. C. Smart, R. M. Hare, Derek Parfit and Peter Singer; and by critics of utilitarianism such as William Frankena, Marcus Singer, and John Rawls. Sidgwick was a founder of the Society of Psychical Research and, together with his wife, conducted methodical research into psychic phenomena in hopes of finding scientific support for religious beliefs. He was actively involved in educational reforms and women’s rights. He helped in the planning and founding of Newnham College for women, and in modernizing Cambridge and establishing broader educational opportunities such as correspondence courses and the Cambridge Working Men’s College. Sidgwick was born May 31, 1838, at Skipton in Yorkshire, England. He was the second surviving son of Mary Crofts and the Reverend William Sidgwick, the headmaster of a grammar school in Skipton, who died when Henry was only three. Henry's older brother William and his younger brother Arthur both went on to become Oxford dons. His sister Mary, known as Minnie, married a second cousin, Edward White Benson, master of Rugby School and early mentor of Henry's, who later became the archbishop of Canterbury. In 1852, at the age of 14, Henry Sidgwick entered Rugby School; in 1855, he entered Trinity College, Cambridge, where his career was a brilliant one and he won many scholarships. In 1859 he was senior classic, thirty-third “wrangler,” chancellor's medalist and Craven scholar. He was elected to a fellowship at Trinity, and became a lecturer in classics, a post which he held for the next ten years. During this time he joined the discussion society named “The Apostles” (Cambridge Apostles), where he learned to discuss various topics with frankness and impartiality. He also read J. S. Mill and was interested in Mill's rational and scientific way of re-constructing ethics. In 1862, stimulated by Renan's Etudes d'histoire religieuse, he turned to the study of religious history. For three years he studied Arabic and Hebrew, but after realizing that this sort of historical study did not solve fundamental problems, such as the credibility of religious doctrines, he returned to philosophy. He participated in several societies, including the “Grote Club,” where he dined with John Grote and others; the Metaphysical Society, where he argued with Thomas Henry Huxley and James Martineau; and the “Ad Eundem” Society, where he met Leslie Steven, W. H. Thompson, and W. G. Clark. In 1869 he exchanged his lectureship in classics for one in moral philosophy. The same year, deciding that he could no longer in good conscience declare himself a member of the Church of England, he resigned his fellowship. He retained his lectureship, and in 1881 was elected an honorary fellow. In 1874, he published The Methods of Ethics, a major work which earned him a reputation outside the university. The same year he founded a company to raise money for the education of women. In 1875 he was appointed praelector on moral and political philosophy at Trinity. In 1876, he married Eleanor Mildred Balfour (sister of Arthur James Balfour). In 1883 Principles of Political Economy appeared, and he was elected Knightbridge professor of philosophy. In 1885, the religious requirement having been removed, his college once more elected him to a fellowship. In 1891 he published The Elements of Politics. Besides lecturing and writing, Sidgwick took an active part in the business of the university, and in many forms of social and philanthropic work. He was a member of the General Board of Studies from its foundation in 1882 until 1899; he was also a member of the Council of the Senate of the Indian Civil Service Board and the Local Examinations and Lectures Syndicate, and chairman of the Special Board for Moral Science. 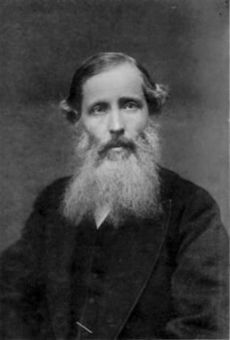 Sidgwick was one of the founders and first president (in 1882) of the spiritualist Society for Psychical Research and a member of the Metaphysical Society; he encouraged a wide range of statistical investigation of psychical phenomena. He also took a prominent role in promoting higher education for women, helping to initiate the higher local examinations for women, and the lectures held at Cambridge in preparation for them. It was at his suggestion and with his help that Miss Clough opened a house of residence for women, which developed into Newnham College, Cambridge, in 1876. When the North Hall was added in 1880, the Sidgwicks lived there for two years. After Miss Clough's death in 1892, Mrs. Sidgwick became principal of the college, and she and her husband lived there for the rest of his life. During this whole period Sidgwick took the deepest interest in the welfare of the college. In politics he was a Liberal, and became a Liberal Unionist in 1886. Early in 1900 he was forced by ill-health to resign his professorship, and died a few months later. Sidgwick was famous as a teacher who treated his pupils as fellow students. He was deeply interested in psychical phenomena, but his energies were primarily devoted to the study of religion and philosophy. He and his wife, together with the Society for Psychical Research, carried out extensive and methodical psychical research, hoping to find scientific evidence to support the existence of a personal life after death, which Sidgwick believed was essential for belief in any moral system. Brought up in the Church of England, he drifted away from orthodox Christianity, and as early as 1862 he described himself as a theist. For the rest of his life, though he regarded Christianity as "indispensable and irreplaceable – looking at it from a sociological point of view," he found himself unable to return to it as a religion. The Methods of Ethics, published in 1874, was his major philosophical work. Sidgwick's other writings include Principles of Political Economy (1883); The Scope and Method of Economic Science (1885); Elements of Politics (1891); and The Development of European Polity (1903). He also wrote on poetry and literature. In political economy Sidgwick was a utilitarian, following the tendencies of John Stuart Mill and Jeremy Bentham; his work was a careful investigation of first principles and of ambiguities, rather than the construction of a new theory. In philosophy he devoted himself to ethics, and especially to the examination of the ultimate intuitive principles of conduct and the problem of free will. He adopted a position which may be described as ethical hedonism, according to which the criterion of goodness in any given action is that it produces the greatest possible amount of pleasure. This hedonism, however, was not confined to the self, but involved a due regard for the pleasure of all, what he termed “universalistic hedonism.” However, Sidgwick did not abandon the principle that no man should act so as to destroy his own happiness, leaving an unresolved dualism. The Methods of Ethics (1874) was a careful examination and analysis of the basic ways in which it was possible to reach a rational basis for actions. Sidgwick defined three basic methods of ethics: egoistic hedonism (or rational egoism), universalistic hedonism (or utilitarianism), and intuitionism (or dogmatic or intuitional morality). Sidgwick attempted to determine the extent to which these methods were compatible, and described each system’s ultimate ideal of ethical conduct, and how each interpreted moral duty. Egoistic hedonism made the private happiness of each individual the greatest good, and justified actions in terms of how much happiness they produced for the agent. Intuitionism held that moral virtue or perfection was the ideal, rather than happiness, and suggested that this might be achieved by actions other than those which promote happiness. Universalistic hedonism made the general happiness of all individuals the greatest good, and recommended following utilitarian principles to decide which actions would achieve this. Sidgwick argued that neither egoistic hedonism nor intuitionism could, by themselves, supply an adequate basis for rational conduct. Instead he proposed a system of “universalistic hedonism,” which, similarly to Kant's categorical imperative, sought to reconcile the apparent conflict between the pleasure of self and that of others. Sidgwick distinguished between psychological hedonism, which affirmed that human actions were motivated by the pursuit of pleasure and the avoidance of pain; and ethical hedonism, which maintained that actions were good to the extent that they produced pleasure and prevented pain. Psychological hedonism and ethical hedonism might or might not be in accord in a particular situation, and the two could used in combination or separately to define the ultimate goal of moral conduct. Sidgwick further divided ethical hedonism into egoistic hedonism (including Epicureanism), which held that every individual should pursue his own happiness; and universal hedonism (including utilitarianism), which directed the individual to act in a way that promoted the happiness of all individuals. Sidgwick contended that egoistic and universalistic principles could be combined in ethical hedonism, in cases where individuals believed that promoting their own happiness would promote the general happiness of all individuals. However, egoistic hedonism could not always be compatible with universalistic hedonism, which dictated that an individual should sacrifice some of his own happiness if doing so would increase the happiness of all individuals. Ethical intuitionism maintained that the principles defining proper conduct could be known intuitively, even if the consequences of an action were not yet evident. Sidgwick divided ethical intuitionism into three phases; perceptional, dogmatic, and philosophical. Perceptional intuitionism held that some ethical truths may be intuitively apprehended; dogmatic intuitionism held that some ethical truths may be accepted without being intuitively apprehended. Philosophical intuitionism held that some ethical truths might be known intuitively, without being undeniably or absolutely self-evident. Actions could intuitively be judged right or wrong based on their motivations or on other intrinsic qualities. Some actions were intrinsically right or wrong, regardless of their consequences; others might be intuitively judged to be right or wrong even if they did not correspond to the actions required by moral duty. A moral duty was defined as a right action which was, at least on some occasions, motivated by a moral principle. Moral duties included obligations to one’s family, friends, community, nation, and to those who were suffering or in need. Sidgwick explained that egoistic hedonism and universalistic hedonism could be described as intuitive methods of ethics, if they intuitively accepted the principle that the enjoyment of pleasure and the avoidance of pain were the only rational aims of human action. Psychological hedonism might be relied on as a theory of motivation in some, but not all, circumstances. Egoistic and universalistic hedonism did not agree with the intuitionist principle that the rightness or wrongness of some actions does not depend on the consequences of those actions. Sidgwick defined virtue as praiseworthy qualities which expressed itself in right conduct beyond the limits of moral duty, such as justice, good faith, veracity, gratitude, generosity, courage, and humility. Practical wisdom and rational self-control were intellectual virtues; benevolence and common humanity were moral virtues. Sidgwick made a clear distinction between universalistic hedonism and egoistic hedonism. Universalistic hedonism considered that all individuals have an equal right to be happy, and that there is no individual whose happiness is more important than that of any other individual. Actions were right or wrong based upon whether or not they promoted universal happiness. Universalistic hedonism promoted moral virtues such as benevolence, generosity, and good citizenship. Sidgwick criticized Kant’s "categorical imperative" to "act only in such a way that you can will that the maxim of your action should become a universal law," as failing to distinguish between subjective and objective moral duty. An individual might feel that he was doing right by complying with the imperative, while acting in a way that was intrinsically and objectively wrong. Sidgwick also criticized Kant’s concept of free will, saying that Kant wrongly equated moral freedom with an individual’s capacity to act rationally, assuming that a fully rational individual would always act according to the categorical imperative, willing that the principle behind his action would become a universal law. Sidgwick argued that moral freedom was the freedom to choose between right and wrong actions, and to act rationally or irrationally, and that Kant’s interpretation did not clarify whether “rational” freedom was the same as “moral” freedom. Sidgwick was one of the most influential ethical philosophers of the Victorian era, and his ideas continue to influence Anglo-American political and ethical theory. He carried out the most thorough and scholarly analysis of the utilitarian principle of “the greatest happiness for the greatest number.” His work has been used as a source by a number of utilitarians, including G. E. Moore, Bertrand Russell, J. J. C. Smart, R. M. Hare, Derek Parfit and Peter Singer; and by critics of utilitarianism such as William Frankena, Marcus Singer, and John Rawls. He was a founder of the Cambridge schools of philosophy, economics, and political theory, and his students at Cambridge included Arthur Balfour, John Neville Keynes, John McTaggart, F. W. Maitland, James Ward, Frank Podmore and E. E. Constance Jones. His personal legacy includes his efforts to promote higher education for women and to develop broader educational opportunities for the working class, such as correspondence courses and the Cambridge Working Men’s College. Scope and Method of Economic Science. 1885. Miscellaneous Essays and Addresses. London and New York: Macmillan, 1904. This page was last modified on 18 December 2017, at 17:02.